Here at The Distillery, we know how much fans love their Fantasy Football. That’s why we’re going to great lengths to make the process even more fun and accommodating for your group. Whether you’re looking for the perfect place to meet and draft your picks, or getting together with fellow fans for the games each weekend, no one does Fantasy Football events like your friends at The Distillery! We’ve put together some great specials to help make this year’s draft more exciting than ever, with our Fantasy Football Draft Parties. Stop in or give us a call to learn more about reserving your personal party zone! If you need a break from living rooms and basement bars, why not give your 2017 Fantasy Football league a much-needed boost of excitement this year! The Distillery has five locations throughout Rochester and Syracuse, and we’re holding our Draft Parties at each one for your convenience. It’s a great chance to meet up with friends, enjoy some great food and drinks, and watch the games in the comfort and hospitality of The Distillery! 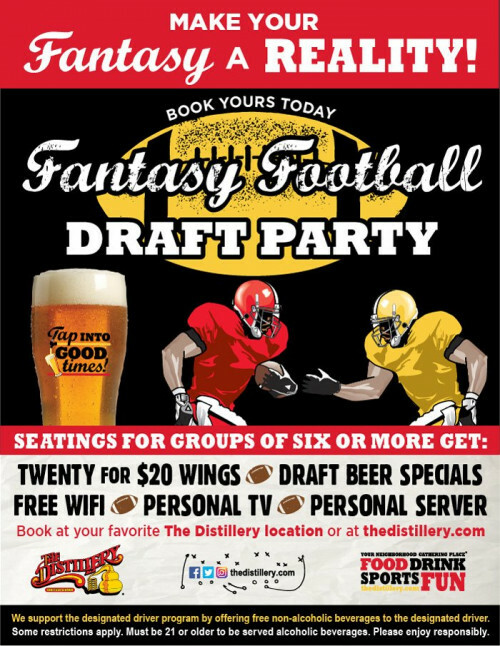 To book your Fantasy Football Draft Party at any of The Distillery’s five locations, give us a call or stop in and we’ll get you all set up.